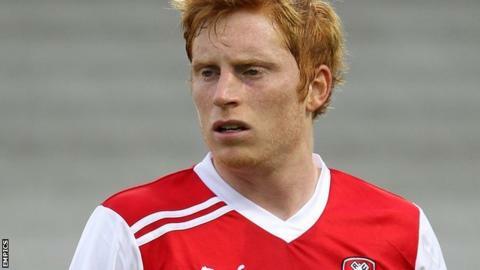 Rotherham breezed past struggling Stevenage to earn a first win in five League One games and stay two points outside the play-off places. Ben Pringle opened the scoring on the rebound after Kieran Agard's header had been saved by keeper Chris Day. Day made several fine saves to keep it at 1-0 but was taken off injured at the break and replacement Steve Arnold's error let Claude Davis head a second. Michael O'Connor's fine 25-yard strike on the counter-attack sealed victory. "It was a dreadful performance. There wasn't too much I could hang my hat on and say I was pleased with. "There was a sentimental fatigue and probably a physical fatigue. We're asking a lot of them; we're sending the same 11 players out game after game. "Mentally the spark wasn't there. The team spirit that has been so strong in the recent run of results was lacking. "The one thing I would say today about the referee is that he was consistent and he tried to allow the game to flow." "It was a good performance but nothing has changed as in terms of league action we've been playing exceptionally well. "The performances have been good and today was just the same. "We have some top players in that dressing room but they work very hard too - they are tired every single morning. "As long as they keep working that hard they'll have that habit of winning football matches." Match ends, Stevenage 0, Rotherham United 3. Second Half ends, Stevenage 0, Rotherham United 3. Corner, Stevenage. Conceded by Michael Tidser. Attempt missed. Luke Freeman (Stevenage) left footed shot from the centre of the box misses to the right. Substitution, Rotherham United. Pablo Mills replaces Claude Davis. Foul by Oumare Tounkara (Stevenage). Michael Tidser (Rotherham United) wins a free kick on the right wing. Substitution, Stevenage. Oumare Tounkara replaces Filipe Morais. Foul by Filipe Morais (Stevenage). Ben Pringle (Rotherham United) wins a free kick on the right wing. Substitution, Rotherham United. Michael Tidser replaces Lee Frecklington. Substitution, Rotherham United. Robert Milsom replaces Michael O'Connor. Attempt saved. Luke Freeman (Stevenage) right footed shot from outside the box is saved in the top right corner. Corner, Stevenage. Conceded by Claude Davis. Attempt blocked. Simon Heslop (Stevenage) right footed shot from outside the box is blocked. Attempt saved. Simon Heslop (Stevenage) right footed shot from outside the box is saved in the top right corner. Richard Brindley (Rotherham United) wins a free kick on the left wing. Attempt saved. Michael Doughty (Stevenage) right footed shot from outside the box is saved in the top right corner. Simon Heslop (Stevenage) wins a free kick in the attacking half. Michael Doughty (Stevenage) wins a free kick in the defensive half. Goal! Stevenage 0, Rotherham United 3. Michael O'Connor (Rotherham United) right footed shot from outside the box to the top left corner. Corner, Stevenage. Conceded by Kieran Agard. Goal! Stevenage 0, Rotherham United 2. Claude Davis (Rotherham United) header from very close range to the top right corner. Assisted by Ben Pringle with a cross. Foul by Peter Hartley (Stevenage). Alex Revell (Rotherham United) wins a free kick on the right wing. Corner, Stevenage. Conceded by Craig Morgan. Jimmy Smith (Stevenage) wins a free kick on the left wing.